John Eardley Eardley-Wilmot (1783–1847), lieutenant-governor of Van Diemen's Land from 1843 to 1846, was sent to the colony to oversee the implementation of a revised system of convict punishment, the probation system. Unfortunately for Wilmot, the Treasury was destitute of funds, and the colony saturated with unemployed convicts. 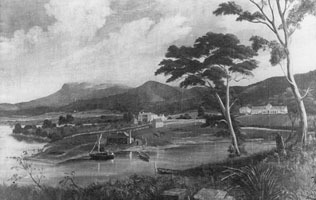 Inexperienced in colonial affairs, Wilmot found the colony's depressed state of affairs an 'insurmountable obstacle', and became a victim of the inherent failings of imperial penal policy in the mid-nineteenth century. Wilmot's economic analysis was acute, but his failure to report concisely on the 'soundness of the principles, and the wisdom of the [new probation system]', ensured that he attracted blame for its inevitable failure. The Colonial Office reported that he had failed in his public duty and he was effectively dismissed from office. Further reading: J Franklin, Narrative …, Hobart, 1967; I Brand, The convict probation system, Hobart, 1990; ADB 1.